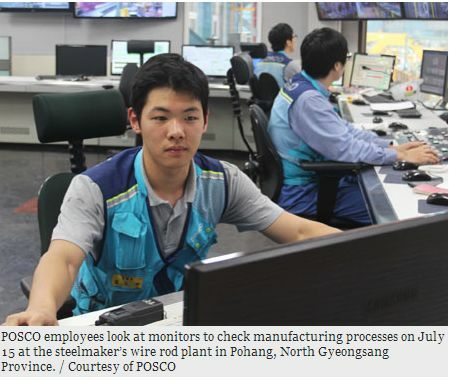 Korea's Information Society: POSCO using Google's cloud-based solutions! Some years ago I recall touring the POSCO steel plant in Pohang and learning that it was highly computerized and the most efficient plant of its type in the world. Today I read in The Korea Times that the company has recently taken steps to strengthen its IT systems and further improve efficiency. What really jumped off the page when I read the article was the following section. "On Dec. 10, 2012, the company launched its Smart Workplace program, partnering with Google and other technology providers. To facilitate communication among employees at various POSCO plants and offices, the company has implemented Google+ Hangouts, a video conferencing app and one of the U.S. Internet giant’s smart workplace solutions. Google+ Hangouts allows employees to access other Google products such as Gmail, Google Calendar and Google Drive, enabling employees to collaborate more frequently and achieve better results." Do POSCO have a steel plant in Ulsan too? I thought they only had plants in Pohang and Gwangyang. Thank you Nigel for correcting me. The plant I toured was in Pohang. I'll update the post.